The food forest is going in the side yard, but first I have to deal with a major drainage issue. 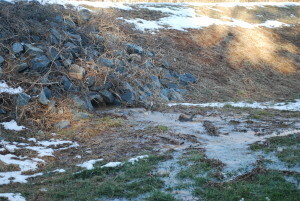 That culvert in the first photograph collects runoff from 90 or so acres across the street and dumps it into my yard. The result is a river of water that you can see in the second photo. The river runs every time we get more than about an inch of rain at a time, or major snow melt. The river in this photo isn’t all that bad, but the ground will be soaked and muddy for months. There usually is a period of about two weeks each spring that the river runs fast, deep, and wide, followed by two months that I can’t walk over to the barn without sinking to my ankles in mud. Heavy summer rain produces a smaller river and a few weeks of mud. Not a good situation for fruit trees or most other food crops, which generally require well drained soil. So, I need to dry up this mess before I get too many trees planted. The simplest solution would be to plug the culvert with concrete, but probably the less legally problematic answer is a six inch solid drain pipe stretching 300 feet from the culvert to the tree line at the back of the property. There’s a small stream back there that can take the drained water without causing problems for the neighbor. 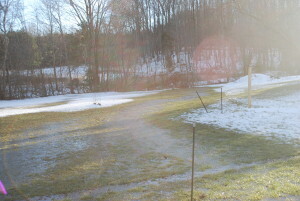 The stream runs across the back of my property to the neighbor’s pond, which in turn drains into a stream and back onto my property. I’ll add two or three strategically placed French drain branches to collect water from a few spots that tend to stay wet even in summer. The end result should be an 80 percent reduction in mud. This area is a low spot, so even after my drains are in place I think there will be plenty of water draining down to grow food without summer irrigation.